Bookings can be made at the Thamesjet Kiosk – on Westminster Pier - Departure point F for travel on the same day. Please have your iVenture Card present. (No pre-booking for alternative dates can be made). Please check website www.thamesjet.com for updated information on timings. There are plenty of leisurely cruises to be enjoyed along the Thames, but how about something that’s just a little more exhilarating? 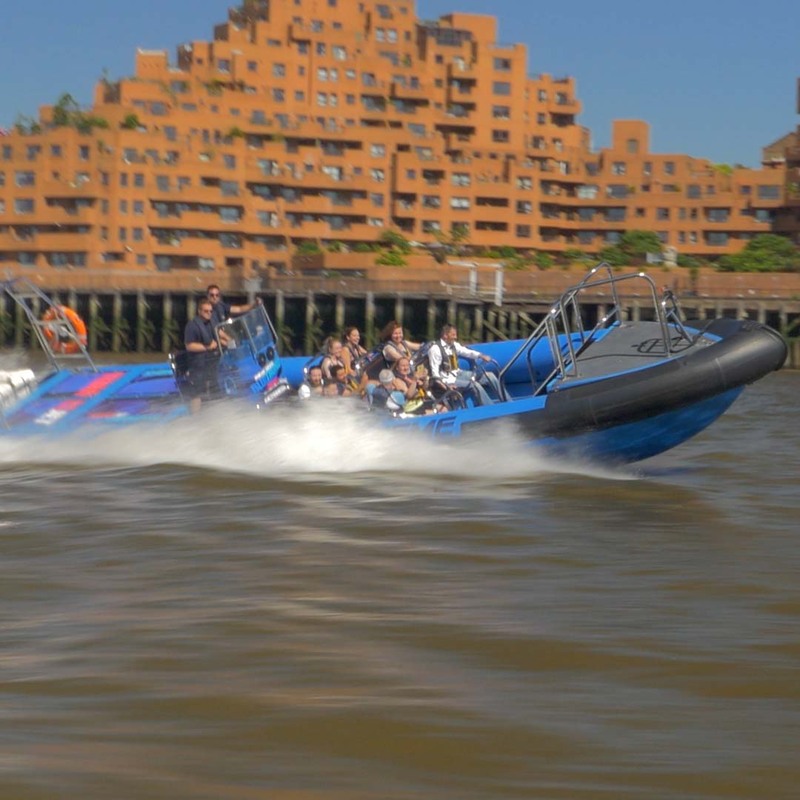 Introducing Thamesjet Rush – a fun-filled, adrenaline-fueled way to take in the sights of London while hurtling along the River Thames in a high-speed RIB (Rigid Inflatable Boat). All river jets depart from Westminster Pier (Point F), so getting there is easy. Simply make your way to Westminster Tube station or river bus. Alternatively, a number of bus routes will take you there from various points around the city. Just remember to arrive 20 minutes before your booking for the safety briefing. Don your life jacket, take in the safety briefing and get ready for the most thrilling river tour of your life. The Thamesjet Rush experience takes you past some of London’s most iconic sites including the Houses of Parliament, Big Ben, the Shard, HMS Belfast and Tower Bridge on a 50-minute journey from Westminster to Canary Wharf and back. While the trip starts at a sensible pace, once your boat reaches Tower Bridge, that’s when your captain hits the throttle reaching speeds of up to 40mph (or 35 knots). At Canary Wharf, things get even more exciting as your talented pilot demonstrates his aquabatic skills pulling off twists, turns and wave jumps. Passing under many of London’s famous bridges, including Millennium Bridge, you’ll discover that the Thamesjet Rush experience really does offer a very different perspective of the city. While waterproof clothing and life jackets are provided, passengers are requested to dress appropriately with flat shoes. Children under 16 must be accompanied by an adult. Please bear in mind that the minimum height requirement to travel on Thamesjet is 1.35 meters (4ft 5in). Thamesjet vessels are not designed for wheelchairs and there are no toilet facilities on board.